A purple burp of a slime biter hid amongst the thicket. The scale-charred sword of the guhl shard drug across the dirt inches away. Though hidden, the blades could cut, giving seconds to escape perhaps, but more assured it would be, they could shoot from the trees, after coating their blades with these links. Marnix Rekkers – Ships. 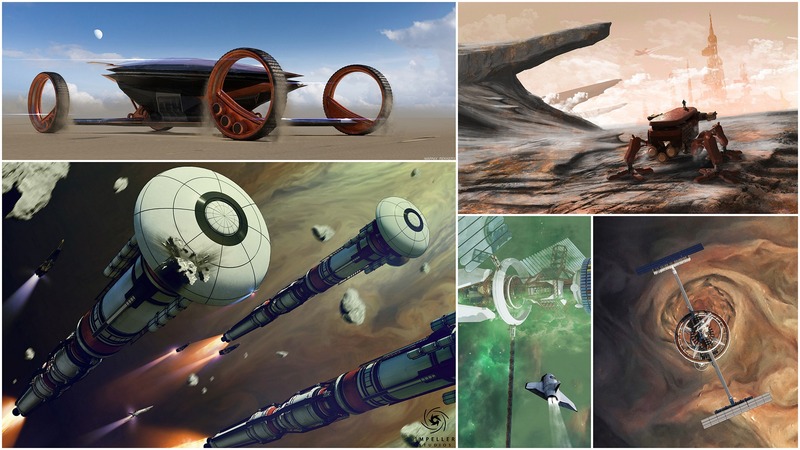 Bunch of ’em, created by Den Dungen-based concept artist. Vehicles as well, like the Magnum Fury and the Magnum Inferno. JDP – Joel Daniel Phillips does amazing things with charcoal. You’ll love the plastic bags in Hazards May Be Present and the deatil and smoke in The Future Was Now. The man who can see all the greys, and reds, and purples in a peach, will paint the peach rightly round, and rightly altogether; but the man who has only studied its roundness, may not see its purples and greys, and if he does not, will never get it to look like a peach; so that great power over color is always a sign of large general art-intellect. Sabritree – You may yet to have seen ceramic art of the caliber of Sabri Ben-Achour who combines clay and metal crystals. On Instagram here. Versailles 3D – A tour of Versailles from the beginning in 1624 to the revolution and beyond in these interactive 3D walkthroughs and 3D scale models for mobile. BLK3.0 – Stuart Semple’s Culture Hustle is known for their color. Now they’ve made their blackest black available in a Kickstater campaign. Moving Stills – Papercut looping animations made by Rebeka Molnár for Czech Television for the gaps during live streaming. 438 Days – How a man was lost and survived in the Pacific Ocean for over a year. Mixer – The PBR texture creation tool is available for free throughout the rest of the beta. RISC – Digital slide-mounted shot counter for Glocks from Radetec. You’d think you’d see more of these for semi-autos. Come Along With Me – Adventure Time fans rejoice. The DVD box set arrives April 30. This is a video for the theme song created with fan-created art and colorings.